Model 4010, deck mounted, single bubbler drinking fountain with stainless steel bowl. Deck mounted units like the 4010 are installed in accessible countertop locations for quick locating and convenient operation. Push button operated stainless steel bubbler valve with adjustable stream regulation make this fountain easily activated and maintained. Slope down stream guide minimizes splashing, keeping the surrounding area clean. 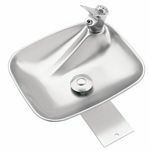 Equipped with mounting bracket and waste strainer, this fountain is vandal resistant and easily placed. Haws manufactures drinking fountains and electric water coolers to be lead-free by all known definitions including NSF/ANSI Standard 61, Section 9, California Proposition 65, and the Federal Safe Drinking Water Act. Product is compliant to California Health and Safety Code 116875 (AB 1953-2006).